Katrina Kaif, Aishwarya Rai Bachchan, Kriti Sanon, Bhumi Pednekar, Sridevi, Madhuri Dixit Nene, Kangana Ranaut, Shah Rukh Khan, Karan Johar and other celebrities brought Bollywood glamour to Virushka's Mumbai reception. Take a look. Virat Kohli and Anushka Sharma’s post wedding reception at St.Regis, Mumbai was nothing less than a grand affair with the who’s who of B-town, cricket world and sports fraternity turning up to bless and congratulate the newlywed couple. With the likes of MS Dhoni, Yuvraj Singh, Harbhajan Singh, Virendra Sehwag, AR Rahman, Anurag Kashyap, Boman Irani, Saina Nehwal among others in attendance, Virushka's wedding reception in Mumbai was a starry affair. And while both Virat and Anushka looked glamorous in Raghavendra Rathore and Sabyasachi attires — an indigo bandhgala for the groom and a smokey grey dazzling lehenga for the bride — other celebrities too turned up the heat in their stunning yet glamourous avatars. From Katrina Kaif, Priyanka Chopra, Kriti Sanon, Aishwarya Rai, Madhuri Dixit, Rekha, siblings Sara Ali Khan and Ibrahim Ali Khan to timeless beauty Sridevi, Shweta Bachchan Nanda and others, B-town celebs turned up in their most stylish attires for one of the most talked about bashes of this year. Yesteryear star Madhuri Dixit Nene looked ethereal in a Tarun Tahiliani saree with zardozi borders which she paired with a hand embroidered tulle blouse. Take a look. Siblings Sara Ali Khan and Ibrahim Khan turned heads in Abu Jani-Sandeep Khosla outfits. While Sara looked stunning in a pista green lehenga, Ibrahim looked dapper in a black bandhgala and a red pocket square. Actresses Katrina Kaif, Kriti Sanon, Aishwarya Rai and Sridevi all opted for one of the most loved designers of B-town for Virushka's reception party -- Manish Malhotra. All four looked absolutely stunning in their respective attires. While Katrina looked glamorous in the designer's signature flowy lehenga, Aishwarya sparkled in handcrafted thread, lace and pearl embroidery yart lehenga, both Sridevi and Kriti looked ethereal in a saree. But while Sridevi opted for more traditional and regal look in a pashmina velvet saree embellished with real zari tilla embroidery from Kashmir, Kriti's six-yard wonder was a modern and a sexier version of the traditional Indian attire. Global icon and B-town beauty Priyanka Chopra opted for a Benarasi weave from her personal collection for Virushka's reception. She looked stunningly pretty in the traditional attire. Take a look. Actress Aditi Rao Hydari stunned in a Manish Malhotra Label Banarasi handloom lehenga, intricately woven in metallic yarns. She teamed the outfit with a satin velvet royal blue off-shoulder corset fit blouse. Take a look. Shweta Bachchan Nanda too turned up in a stylish Abu Jani-Sandeep Khosla soft pink chikankari saree paired with a pearl and crystal scallop blouse. Take a look. 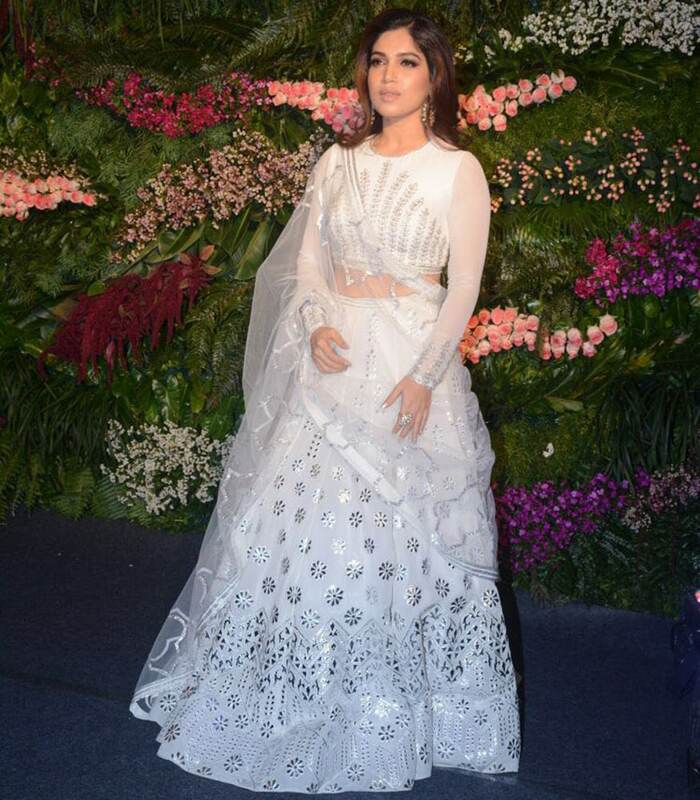 Bhumi Pednekar was a vision in white at Virushka's reception. Take a look. Styled by Ami Patel, actress Kangana Ranaut looked gorgeous in a Sabyasachi kanchivaram weave. 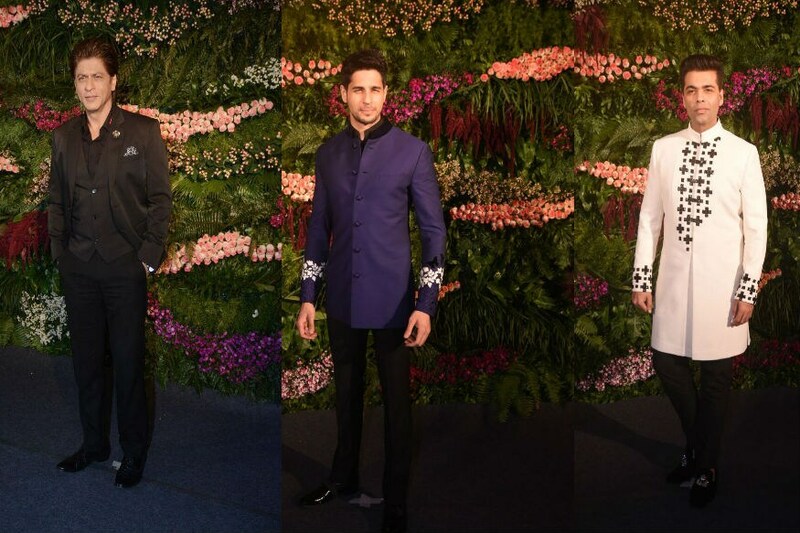 It was difficult to get our eyes off the handsome men Karan Johar, Siddharth Malhotra, Shah Rukh Khan, who rocked in their respective attires at Virushka's reception. Virat and Anushka tied the knot on December 11 in a intimate ceremony in Tuscany, Italy. The couple later hosted a post wedding bash in Delhi before throwing a lavish party for their friends at Mumbai's St. Regis.